Looking to present a gift in a special way? We have it covered. 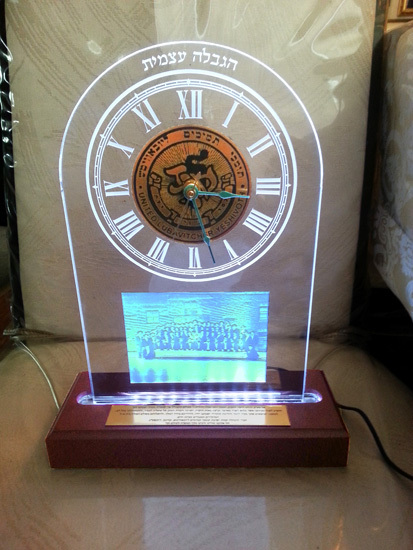 Be it corporate, private or organization our custom acrylic Gift Box is a great way to take that gift one notch up. Our gift boxes are custom sized and designed exactly how you like. Want to make it extra special? Add a personal message or your company logo. Displayed size: 4x4x6" size including the base is 9 1/4 inches high. Looking to present a gift in a special way? We have it covered. 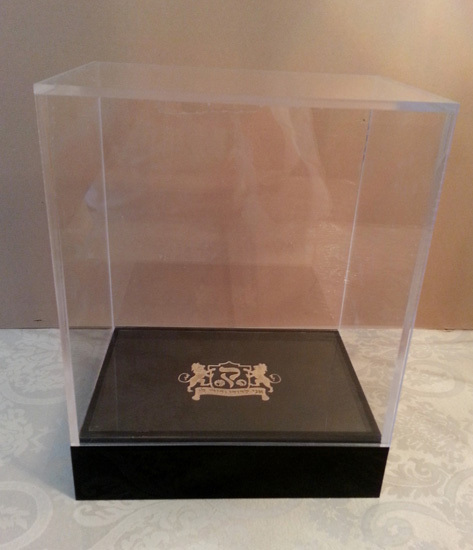 Be it corporate, private or organization our custom acrylic Gift Box is a great way to take that gift one notch up. Our gift boxes are custom sized and designed exactly how you like. Make your gift box extra special and add a personal message or your company logo. Displayed size: 7x10x12" size including the base is 12 inches high. 9" x 12" Award plaque. If your looking for an affordable really nice looking plaque, this is it. 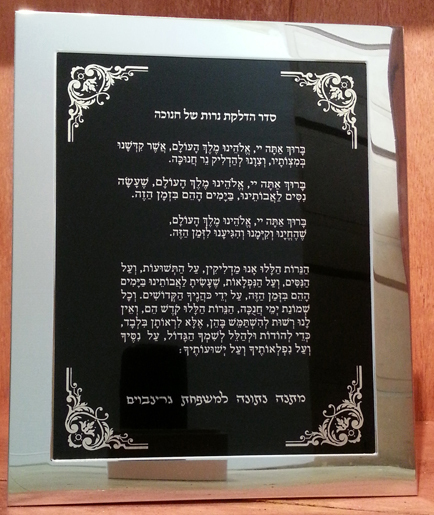 The plaque is made up of a black brass and a gold aluminum sub plate mounted on a beautifully finished wood. Contact us for wood styles and colors. 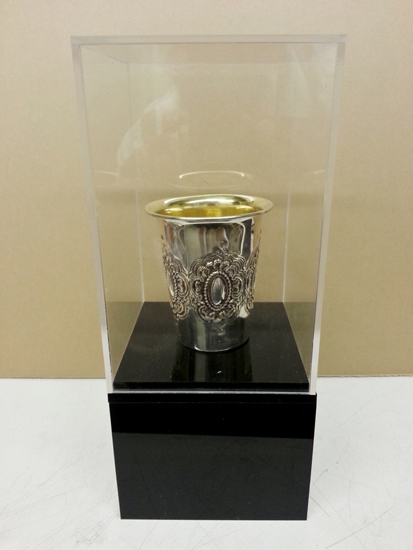 9-1/2" x 11-1/2" Blessings for the Menorah on black aluminum with a polished silver frame. Item is self standing and is customized to customers specifications (including Nusach). Makes a great Chanukah gift to a friend or family member. 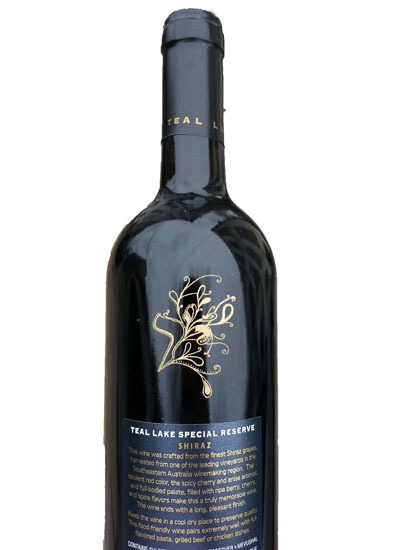 Enhance a gift or event while making an everlasting impression.. Have your logo, monogram or personal message engraved on your bottle. Standard color for this bottle is in frost. Silver or gold may be available upon request. Contact us for bulk orders and special pricing. (This item does not include the actual bottle). Enhance a gift or event while making an everlasting impression. 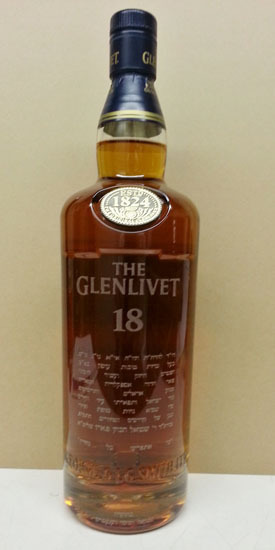 Have your logo, monogram or personal message engraved on your bottle. Standard color for this bottle is in frost. Silver or gold may be available upon request. Contact us for bulk orders and special pricing. (This item does not include the actual bottle). 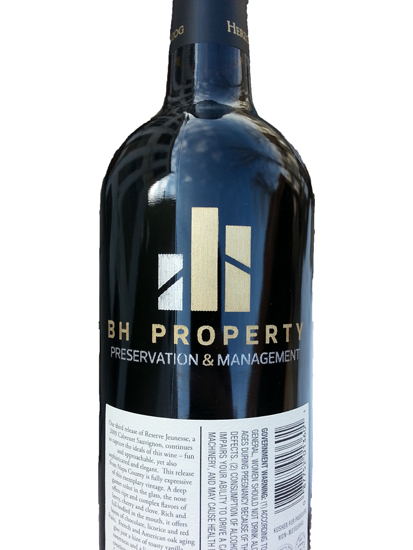 Enhance a gift or event and make an everlasting impression.. Have your logo, monogram or personal message engraved on your bottle. 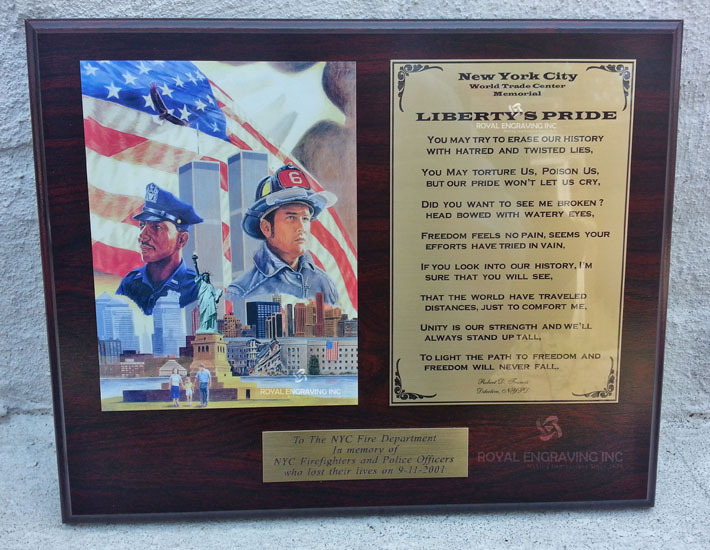 Engraving is offered in 2 colors, gold or silver. Contact us for bulk orders and special pricing. (This item does not include the actual bottle). Enhance a gift or event and make an everlasting impression. Have your logo, monogram or personal message engraved on your bottle. Engraving is offered in 2 colors, gold or silver. Contact us for bulk orders and special pricing. (This item does not include the actual bottle).